For kids the best time of the year other than Christmas is Halloween. It is a time of the year when there is a slight nip in the air, promises of fulfilled festivities and of course an unlimited supply of candy treats. They can last you for a long time to come, or simply be consumed over the next few days. Little does your little one realize that all those sugary treats can play havoc with their dental health. 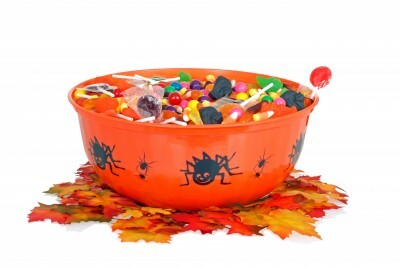 Candy typically is made of hard sugary mixes which are bad and very hard on the teeth. Not only do the various forms of sugary substances leave a sticky and a harmful residue, it can be the beginning of harmful cavities. Eventually they start spreading and start eating into the tooth enamel, causing immense pain and discomfort. Additionally continuous biting into hard candy can also inadvertently cause a chip or crack in the tooth enamel, causing it to break. The dentists feel that it is better to eat sweets – though in moderation – after a meal, and not in between meals. Our mouth tends to produce more saliva after a meal. This helps to wash down the sugary residues than letting them stick to the teeth enamel. On the other hand, consumption of sugary products as snacks works just in the opposite direction causing unimaginable damage. Truth be told, it is difficult to stop kids from consuming candies. With that said, the best possible option is to inculcate good habits that stay with them all through their lives. Brushing and flossing your teeth regularly and after every meal helps to protect the dentures from the attack of bacteria or the onset of cavities. Also, as parents one may restrict the quantum of candy consumed over a day. You can also try and educate your child on the negative effects due to excessive consumption of candy and how it can damage the health of their teeth right from an early age. Sometime, talking like an adult helps, rather than scolding or punishing!